Over 50 Years Experience. 40,000 sq. ft. Facility. Truck Equipment & Service Company Limited (Tesco) was established in 1966. Since this time we have been providing our customers with various truck related solutions. With our extensive range of products and services we are able to meet the needs of various industries – Transportation, Municipal, Waste, Haulage, Landscape, Construction, Food and Beverage. We are certified by Transport Canada under NSM#169 as an intermediate and final stage manufacturer. This means that every truck up fit performed by us is done according to Transport Canada’s Standards providing you peace of mind. Our team is comprised of various skill sets: Licensed Technicians, Welders, Fabricators, Hydraulic Specialists, Body and Paint specialists. Together with these combined talents we can offer our customers many solutions under one roof. Tesco is an authorized Navistar subcontractor through Tallman Truck Centre. We are able to provide parts, service and warranty for your international truck needs. 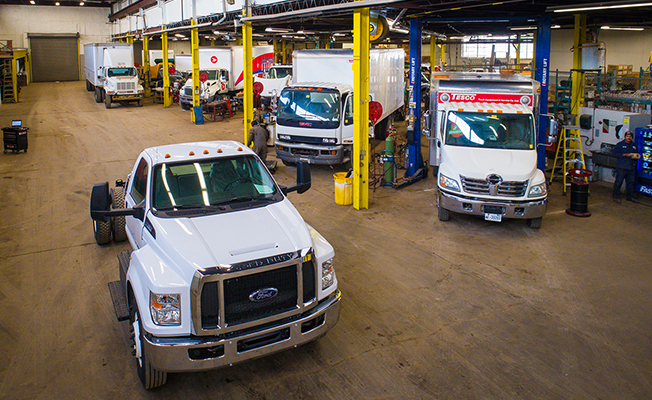 We have vehicles on the road daily, providing parts delivery throughout the GTA. Our staff is comprised of Licensed 310T Technicians, Registered Apprentices and Industry Professionals that can service all your needs. We are an authorized MTO Inspection Station which can provide Annual, Semi-Annual and 36-Day Inspections. We are an authorized Drive Clean Emission testing centre. We provide mobile Heavy Duty Diesel Emission Testing. Our Partnership with Twin Equipment Ltd.
Our sister company Twin Equipment Ltd. is a full line equipment house capable of creating custom upfit solutions for most vocational applications. From snow and ice control equipment to dump bodies, from stake platforms to hydraulic lift gates and hook lifts, to van shelving packages and ladder racks - our dedicated team are always ready to help our customers find what they want or manufacture what they need.